Thursday, June 9, 1859.Springfield, IL. Lincoln answers letter from Jonathan Haines: "I do believe it would be better all round to let me surrender both your cases to some lawyer at Chicago. I really can not give them proper attention." 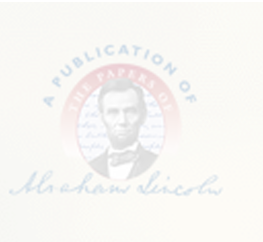 Lincoln writes to Ohio Governor Salmon P. Chase regarding the Ohio Republican party's recent convention, where delegates called for a "repeal of the atrocious Fugitive Slave Law." Lincoln notes, "I have no doubt that if that plank be even introduced into the next Republican National convention, it will explode it. Once introduced, its supporters and it's opponents will quarrel irreconcilably. . . . I enter upon no argument one way or the other; but I assure you the cause of Republicanism is hopeless in Illinois, if it be in any way made responsible for that plank." Abraham Lincoln to Jonathan Haines, 9 June 1859, CW, 3:384-85; Abraham Lincoln to Salmon P. Chase, 9 June 1859, CW, 2:384. In evening the Lincolns entertain. Browning, Diary. Mrs. Lincoln buys 16 yards of "Grenadine" ($32) and ice cream salt at Smith's store. Pratt, Personal Finances, 157.